I am considering purchasing this power bank. I will be using it for long distance backpacking trips where I will be without power for a week or more. I have 2 questions. I see this power bank is made of an aluminum casing where as the PowerCore 26800 (Model A1277) is a plastic casing. Am I correct in assuming the aluminum casing power bank will be more sensitive to cold temperatures than the one in the plastic casing? If I use the USB-C power port to charge my iPhone, or a micro-usb device, what kind of adapter or cable would you recommend I purchase? I believe the one that comes with the power bank is USB-C on both ends? If by temperature sensitive you mean it will effect how well it holds a charge than you’re wrong. If you mean it will be cold to touch than yes. Batteries generally aren’t really affected by cold weather anymore. Anker just released a USB-C to lightning cable a few days ago. It’s still in preorder but it shouldn’t be too long. Best practise is to keep the pack warm while trying to charge devices, keep it close to the body or wrapped in a wool socks. I don’t know about that. I don’t think lithium ion batteries are affected by cold weather. I’m pretty sure only lithium polymer batteries are. I see. Well I remember this next time! Thanks for correcting my ignorance! Nice. I’ll remember this chart! I have a Anker PowerCore+ 26800 PD (Model A1375). Its a great device but in my experience is it doesn't hold anywhere near the mah advertised... infact mine only holds around 10000mah. How do you figure it only holds 10000mah? mAh is a misleading unit for battery packs. Since it doesn't tell the user that it is calculating based on 3.6 or 3.7 V.
For our beloved 26800+ this is 3.6 V x 26.8 Ah = 96.48 Wh (this is the actual capacity of this battery pack). When you charge any device out of this then this battery pack should provide 85-95% of this capacity (accounting for transfer losses). You can use a usb meter to determine the actual capacity of the battery pack by discharging it 100% and then charge to 100%. 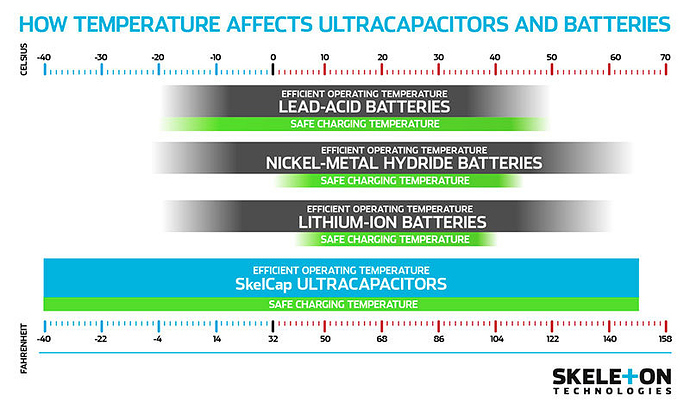 li ion batteries can operate at much lower temp when discharging but doesn't work well if charging at low temp. It can be discharged between -4F to +140F but should be charged only between 32F to +113F. At lower than these temp li+ mobility drops drastically and you will see the battery will report itself as empty (in reality it is not empty). As soon as the temp comes up it begins to perform again. Well, I was thinking the person asking would be taking about discharge. I mean, who charges there battery in the snow?